She Who Must Be Obeyed likes those casseroles that our mothers used to make. You know the ones, a can of mushroom soup, noodles, cheese and some kind of protein. Mostly they were pretty bland. Who would want those. Ok, they’re not that bad. Don’t look at me like that. Ok, I like them too. However, they can be adjusted to make them more flavourful and made from less processed food. That is what I have done with Beef Mushroom Casserole. I started by chopping the onion and garlic. I put vegetable oil in the saucepan and sauteed the onions just until some brown started to form on the bottom of the pan. I added the beef and garlic and sauteed until the meat was cooked through and getting a little brown. I added the remaining vegetable oil and the flour. I sauteed until the flour started to brown a little on the bottom of the pot. Then I added the rest of the ingredients, except the cheese, and brought them to a boil. I reduced the heat and simmered, covered, for 10 minutes, stirring every couple of minutes. 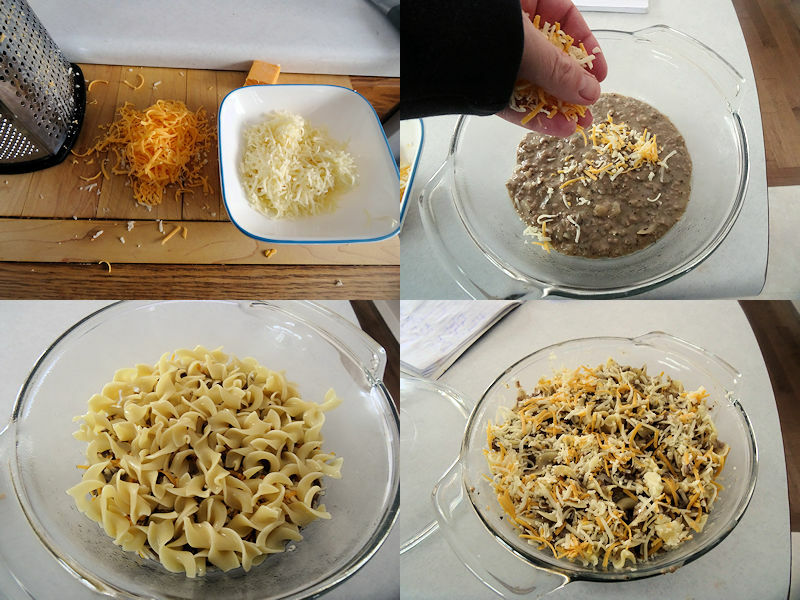 I grated the cheeses and mixed them. I used Monterey Jack and Cheddar as I find Monterey Jack gives a nice creamy melt in the sauce and the Cheddar gives some colour. Then I put 1/3 of the meat mixture in the bottom of a casserole that had been sprayed with baking spray. I put 1/3 of the cheese on top of that. I put 1/2 of the noodles in and topped them with 1/3 of the meat mixture and 1/3 of the cheese. I put the last 1/2 of the noodles in and topped with the remaining meat mixture and cheese. I baked it, uncovered, in a 350 F oven for 40 minutes. I like to let it cool for 5 minutes before serving. 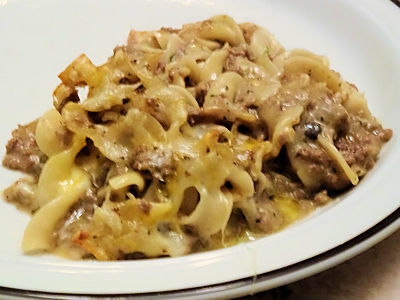 This is creamy like the casseroles our moms made but have a more refined taste and are more than cheesy mushroom soup. While there is a more adult flare to it, it isn’t so over seasoned that kids wouldn’t still like it. 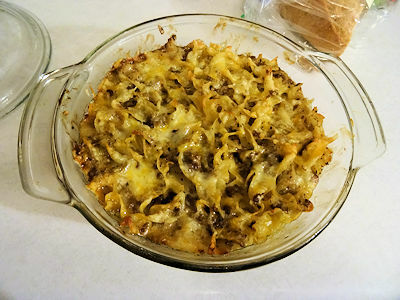 This is a very good casserole. 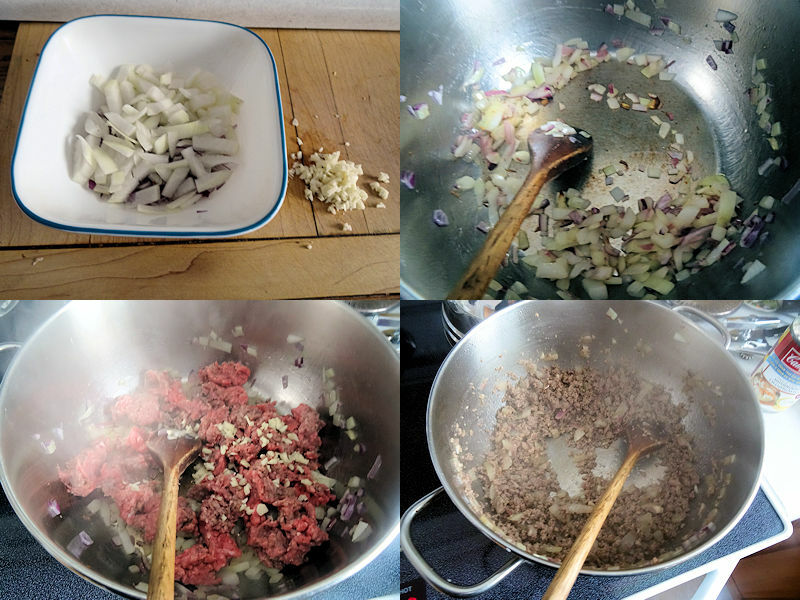 Put 15 ml oil in a saucepan over medium heat and saute onions until some brown starts to form on the bottom of the pot. Add the ground beef and saute until the beef is cooked through and a little browned. Add the 25 ml oil and sprinkle the flour over the beef. Saute until the flour starts to get a little brown on the bottom of the pot. Add the mushroom soup, water, oregano, basil, soy sauce, sherry and Worcestershire sauce. Bring the mixture to a boil, reduce the heat and simmer for 10 minutes, covered, stirring occasionally. Put 1/3 of the meat mixture in a casserole that has been sprayed with baking spray. Sprinkle 1/3 of the cheese over the casserole. Spread 1/2 of the noodles over the casserole. Spread 1/3 of the meat mixture. Sprinkle 1/3 of the cheese. Spread the remaining 1/2 of the noodles. Spread the remaining 1/3 of the meat mixture. Sprinkle the remaining 1/3 of the cheese over the top. Bake the casserole, uncovered, for 40 minutes. How kind! We did enjoy it. LOL… I know my Momma never put that many ingredients in a casserole. LOL….. Heck any spice besides salt and pepper meant it was a special meal. You know, the preacher commin to eat or some friend’s wife was outta town and he couldn’t feed himself…. I never could figure if women did that to keep the lonely husband out of harms way or they seriously thought he wouldn’t eat. BTW you used sherry, baby sister brought me a bottle of “Cooking wine” she figured would last longer. Its wine made from red onions….. Have not tried it yet. I know what you mean, Foam. The closest thing to a seasoning my mom put in a casserole was Velveeta. Wine out of onions? I can understand why you haven’t tried it! Yes! The Pan Handler loves those old time casseroles we grew up eating. Occasionally I’ll make them on my own like this or with a roux mixture. Well played sir! Thanks for sharing.